Officially known as the Republic of Lithuania, Lithuania is a country located in Northern Europe. Lithuania is bordered with Latvia to the North, Poland and Russian exclave of Kaliningrad to the southwest and Belarus to the southeast. Spread on area of 25,174 sq mi, Lithuania has population of around 3.2 million. Lithuania is a country of castles, lakes and forests. Vilnius International Airport is the largest airport in the country and has capacity of handling around 2 million passengers. The travelers arriving at the airport can explore all the attractive destinations of this country by hiring a car with Lithuania Cars Rental. Vilnius, the largest and capital city of Lithuania is one of the most charming cities of Europe. 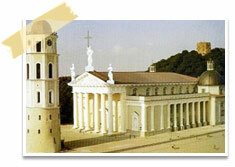 The history and art lovers can spend pleasurable time in Vilnius which is the historical city of the country. The old town, which is the largest in Europe, is considered as the UNESCO world heritage site. Another must see attractions of Vilnius are the Gediminas Square, which is located at the heart of the city and the University of Vilnius which has a great historical importance. Another famous historical of Lithuania is Trakai which was the ancient capital of the country. Located on the bank of Lake Galve, this town has a beautiful castle which dates back to 14th century. For the travelers interested in adventure sports, Lithuania offers great hiking opportunities at the Curonian Spit National Park which is a UNESCO World Heritage site. The visitors can also enjoy serene lagoons and small and large dunes near it. The history and architecture lovers can visit the Kedainiai, which is known for the old architecture, ethnic culture and rich history. Why choose Lithuania Cars Rental? With a wide range of rental locations to choose from, Lithuania Cars Rental offers excellent car hire deals for leisure as well as business travelers. The travelers can easily book the cars online and avail great discounts. At Lithuania Cars Rental the travelers can find top-notch car hire service at the most competitive rates. © 2019 LithuaniaCarsRental.com , All Rights Reserved.